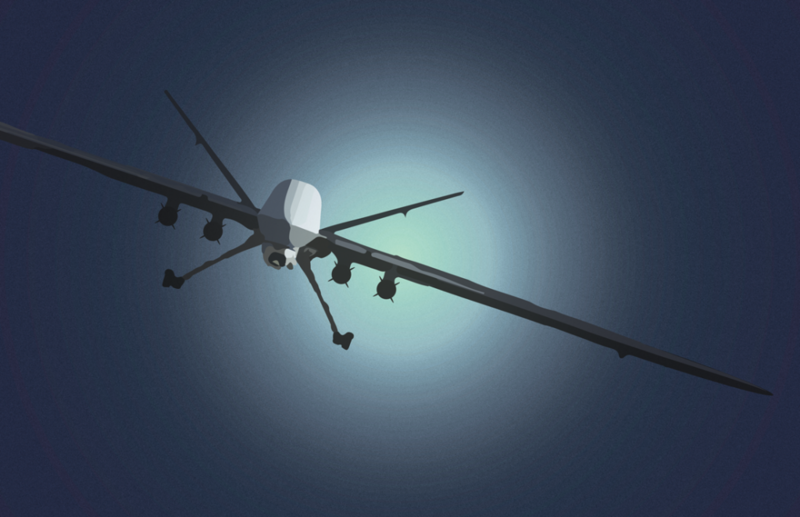 The rise of drones and the military-academic-industrial complex. In April 2012, Cornell University found itself in the midst of a bit of controversy. A series of documents released by the Electronic Frontier Foundation showed that Cornell was one of a handful of educational institutions and a larger number of police stations with a Certificate of Authorization from the FAA to fly a drone. While a Certificate of Authorization (referred to simply as a COA by those enmeshed in the world of unmanned aviation systems) hasn’t been held by the university for a few years, they’re still quite involved in the development of drone technology. The extracurricular group Cornell University Unmanned Air Systems (CUAir) “aims to provide students from all majors at Cornell with an opportunity to learn about unmanned air systems in a hands-on setting,” according to their website. CUAir took home first place at the Student Unmanned Air Systems Competition held at the Naval Air Station Patuxent River in Maryland, June 19-22. The website for the group lists, after the University as its only Diamond sponsor, the top category, Lockheed-Martin and Electronic Warfare Associates as its platinum sponsors. Unmanned aircraft systems have received a growing amount of media coverage in the context of their militarized uses in Pakistan and Afghanistan (although the bulk of that coverage has still been relegated to the alternative media sphere), yet general knowledge of the fact that unmanned systems for domestic uses have been growing is weak and they are poised to become integrated into general airspace as soon as September 2015. Two pieces of Federal legislation passed in January of last year: The Federal Aviation Administration Modernization and Reform Act of 2012 and National Defense Authorization Act for Fiscal Year 2012 require the FAA to choose six national test sites for research centers for remotely piloted aircraft, and begin their integration into national airspace in 2015. Since the announcement, there has been a flurry of activity by the drone industry and research sectors to establish themselves as frontrunners in the contest to be approved for both the use and development of these systems. A variety of organizations have submitted applications to be chosen as one of the six test sites. According to Senator Chuck Schumer (a big proponent of New York being chosen as one of them) out of 50 initial applications the list of applicants has been narrowed to 25. The winners will receive a five-year contract with the FAA to conduct research. In New York State, that applicant is the Northeast UAS Airspace Integration Research Alliance (NUAIR). Made up of 40 public, private and academic organizations, their research would potentially happen in many parts of New York and Massachusetts (probably mostly in existent military airspace,) but would be focused in central New York. Alliance members include Lockheed-Martin, many of the existent upstate New York airports or military testing areas, as well as about a dozen academic institutions, according to Andrea Bianchi, program director of NUAIR, among them both SUNY Binghamton and Cornell University. Apparently the IDA does not see a potential conflict of interest in working with academic leaders and top government intelligence officials, however. The site proudly proclaims the Defense Science Study Group’s purpose of bringing together “young professors from many of the nation’s top universities” who are “invited to participate focus on defense policy, related research and development, and the systems, missions and operations of the armed forces.” According to the program’s website “members interact with top-level officials from the Defense Department,” as well as visiting military bases, defense labs and interacting with Congress. In short, it seems to be a total overview of the United States’ defense operations. Campbell’s interest in UAVs would seem to extend beyond being a purely research-focused interest. Incidentally, the Institute’s CEO and President, David S.C. Chu, served as Under Secretary of Defense for Personnel and Readiness for the entirety of the George W. Bush administration, so any argument for IDA being anything other than an extension of the government with more autonomy in how it operates is definitely dubious. While the research NUAIR hopes to conduct would be for civil and commercial purposes, the existent military assets in New York and Massachusetts still set NUAIR’s application apart in the alliance’s view, according to Bianchi. She said this is because drone technology is already used for military purposes. The large amount of existent military airspace in the state would also allow NUAIR to begin testing very quickly once their application is approved. The 174th Air National Guard Attack Wing is one of the key military assets in NUAIR’s proposal, and is located at the Hancock Airfield just outside Syracuse. It is from here that one of the now-infamous MQ-9 reaper drones deployed in Afghanistan is controlled from. The group Upstate Coalition to Ground the Drones and End the Wars, as well as other activist groups, have protested there multiple times, and many people have been arrested, although five arrestees just received a groundbreaking acquittal. There was a resolution supported by the Syracuse Peace Council and some Common Council members that was set to be voted on to make Syracuse a “warrantless surveillance drone-free zone” until Congress accepts legislation that protects people from spying from the unmanned aircraft, but as of October 2 the Syracuse City Council put the decision on hold because they needed more information about the mesh of local rule and federal law. NUAIR naturally lobbied against such proposed legislation. The Syracuse Peace Council is “ worried about first and fourth amendments being violated,” according to Ann Tiffany, an anti-drone activist and council member who has been working on the anti-drone resolution. Tiffany thinks there’s the potential for good uses of drones, but given the fact that “the FAA has given permits to 80 police departments” already, the council is worried about where uses are heading. “I think every time a community drafts a resolution like this, it helps to strengthen the national picture,” said Tiffany. Despite the lack of national political discussion, Benjamin does think the media has a certain fascination with drones, that the allure of flying robot-servants is too large for it to not grow in scope as an issue. “The media does show all these cute uses of drones––to bring you your pizza, and your taco” she said,“I think the media’s very intrigued by drones… and that will spur backlash. Imagine when the first drone … gets shot down by somebody,” Benjamin said. The economic potential is huge for central New York if NUAIR’s application is one of the winners, and would be for any region chosen as one of the six. Civil and commercial use of unmanned aircraft systems in the U.S. could supposedly have an $82 billion-plus economic impact in the first 10 years. Perhaps these promises of an economic boom are causing politicians to waive security and privacy issues aside? So far the nature of how these systems will be integrated into our airspace is almost entirely undetermined. We only know that they will be a part of future skies. The frightening part is that the integration will be so soon and has been pushed for relentlessly by industry without there being sufficient public dialogue beforehand. Benjamin puts it in starker terms. “I think it’s natural that the industry would go for anything that it can,” she says, and “when it saw particularly that the wars were winding down it was really anxious to look for other venues” to develop a market for its technology. All of the mainstream coverage of the FAA plan has acknowledged security and privacy concerns, but ultimately echoed the view of government and industry officials who claim that those issues will be addressed to the fullest extent possible during the testing process. While group representatives are quick to offer lists of the many uses drones can be used for that will be beneficial on a mass scale, the only address of privacy concerns at the national level seems to be an assurance that they will be addressed. In just over 50 years we’ve gone from being warned of a burgeoning military-industrial complex, to the normalization of privatized national security services with academic institutions being outwardly involved in the development of technology used to keep the military-industrial gears churning. It almost seems the term “military-industrial” doesn’t properly account for the nuanced, yet substantial and profitable role of academic institutions as liaisons between the military and industrial factions of the American economy. Academia gives these government-industry relationships credence by validating their ethical purpose through acceptance of military research money, and speaking on the technology’s merits as veritable government spokespeople. Max Ocean is a junior journalism major who’s keeping his eyes on the sky. Email him at mocean1[at]ithaca.edu.